Passengers 1250 nominal. Such ships were often operated at 150% capacity in practice. 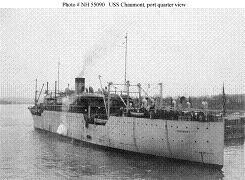 The Chaumonts were completed for the Navy in 1921 as Hogg Island Type B troop transports, in which role they served throughout the 1920s and 1930s. They were capable of transporting at least a Marine regiment. The ships were notoriously unstable, limiting the amount of antiaircraft armament they could ship. As a result, they were converted to hospital ships.